Nozze, the Italian word for wedding, is a fabulous event. In Italy, there are many old traditions thought to bring good luck and happiness. Many traditions in Italian weddings are shared with other European cultures, but there are some age-old superstitions that involve food, unique to Italy! For good luck, brides traditionally spend the night before the wedding at her parents’ home. 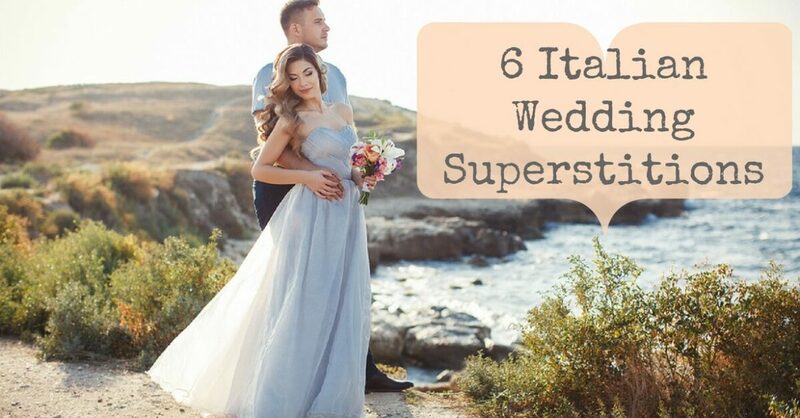 Like many traditions worldwide, it is bad luck for the groom to see the bride before the wedding, but in Italian custom, it is bad luck for the bride to look at herself in the mirror before she is dressed in her wedding dress! In some traditions, she is also required to remove a glove or shoe before she can look at herself in the mirror. In the morning, before going to the church, there is a custom of plate-breaking. A ceramic or glass plate is filled with flowers, candy, and rice, which is then broken by neighbors near the bride’s feet. She steps over this broken plate and exits the house. It is believed to bring good luck and prosperity to the newlyweds. Most of us would now think of rain as bad luck for a wedding – especially if it’s an outdoor affair. But it doesn’t have to be, if you plan your wedding reception with us at Cucina Toscana! Rain on a wedding day is good luck in Italian superstition. It is believed that rain symbolizes fertility and cleansing. It is also believed that rain is tied to luck and an abundance of love. Italian superstitions of rain believe that it is a “raining down of luck on your future together,” and could grow “an abundance of love.” This superstition may have been derived from agricultural regions, tying rain to an abundance of crops.